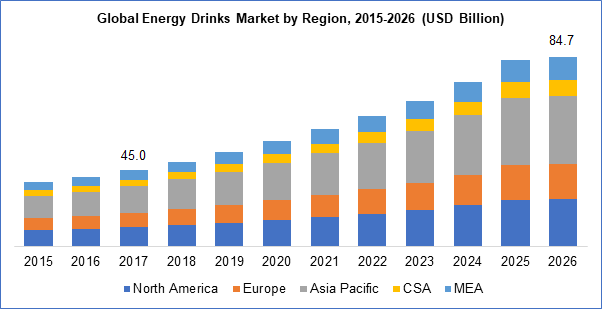 The global energy drink market size was estimated to be worth USD 44.5 billion in 2017 and is estimated to grow at a CAGR of 7.3 % from 2018 to 2026. It is the most rapidly developing segment of soft drinks industry and strong prospects for future growth and increase in sales. Industry participants have been on focus to represent these products as drinks for particular nutritional benefits. Marketing campaigns are focused towards representing them as sports drinks that formulated to be consumable by all consumers groups during time of high level of metal effort or vigorous mental physical activity. These type of marking and sales promotional activities apart from the micro and macro-economic factors have been crucially playing a significant role in higher consumption of energy drinks during the past few years and has added to its demand. Changing consumer lifestyles and growing demand for alcohol mixtures are few of the factors driving product demand. Functional aspects of these drinks are yet another factor driving is demand for different uses. Product sales growth is also witnessed in terms of volume and is significantly fueled by rising emphasis on convenience packaging and interesting designs to attract customers. Japan and the U.S are the globally leading markets in the present industry scenario, however the dynamically developing markets are China, Brazil and India. These products account for approximately 16% – 18% of non-alcoholic beverages and compete directly with other non-alcoholic beverages such as brewed coffee and soda. Ready to drink tea and soda are among the most consumed non-alcoholic beverages and offers stiff competition as these offers benefits of antioxidants also boosting caffeine. Energy shots are among the new adopted product trends in several new emerging nations as its existing high demand in the U.S. and UK. Growing acceptance for consumption of these beverages globally has been a new trend observed lately. Visibility and acceptability are most likely to encourage impulse purchases and boost consumption frequency. As these are among the highly priced or costly beverage segments available, consumers consider price as a major attribute before purchasing. Moreover, consumers in this segment of beverage are most brand loyal and hence companies such as Red Bull get their first mover advantage and these attributes of consumers have created a significant gap been the growth trends of the already leading players in the market that are able to maintain a stronghold and the new entrants thus extending their timeframe for gaining brand loyalty. The global energy drinks industry has been segmented into four levels. 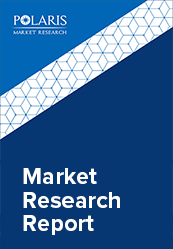 In terms of products, the market is further segmented into non-alcoholic, caffeinated beverages and sports drink, by type (organic, non-organic, natural), by distribution channel (on-trade, off-trade and direct selling), by regional markets. Organic and naturally developed or ingredient containing drinks are the fastest growing ones in the present industry space. But non-organic segment and caffeinated segments claims to be the largest segments. This is owing to the fact that these were the first introduced energy drink segments in markets such as the U.S., UK, Japan, China etc. and still holds a majority percentage of consumer preference levels. Owing to concerns over ingredient content in these products, several new brands are offering all-natural products that provide a long-lasting energy boost. Flavor and packaging size are the other important criteria for brand selection. Moreover, increasing urbanization, rising consciousness for a healthy lifestyle and increasing levels of disposable income, primarily among the world young generation are driving demand for these non-carbonated beverages and sales will further increase with its rising adoption. Industry participants are focused on continuously communicating with their target audience. They carry out promotional activities in nightclubs, sports events, concerts, hotels etc. Companies have been trying to take measures to avoid being compared their products with soft drinks in terms of prices. The industry participants have been trying above and below line advertisement campaigns to create awareness for new target consumer base and gain higher market share. Asia Pacific energy drinks market was the largest in 2017 with a share of approximately 30%. Japan is the largest consumer of these products in the region leaving behind the fast-growing markets of India and China. In 2017, Japan’s energy drinks market has continued to develop in terms of both volume and off-trade. The country’s consumer base of energy drinks are dominated by the middle aged men, but the trend has been developing among the younger generation men and women both the current market scenario. The classic brands in the country are still the leading market share holders. With several differences from the international brands, the classic brands in Japan including Dekavita C, Oronamin C, and Real Gold have bigger consumer bases among every generation. However, international brands have been gaining increasing popularity lately. Expansion of flavors and setting up and maintaining a strong distribution network has been the primary strategy of the MNCs in the country. India has been the fastest growing market recently in the region with Red Bull leading the sales figures for caffeinated energy beverages and Gatorade leading the sports drink segment. Indian energy drinks manufacturers, in an attempt to offset the rising raw material prices, foreign exchange rate fluctuations, and rising cost of electricity, price of these beverage category has recently been increased and this is considered as a restraining factor for sales growth. In India, energy drinks consumption can be considered more of an urban phenomenon that is limited to the mini metros and metros. Product distribution mainly takes place via organized channels that are relatively easy. But, bagging specific places for their products on retail shelves of the popular brands has become a challenge for the new companies planning to enter the dynamic Indian market. The energy drinks segment of the beverage industry are still in a nascent stage of its development with the existing multinationals still trying to penetrate and explore several untapped consumer base in several nations. Some of the currently well-known brands in the industry include PepsiCo, GCMMF, Coca-Cola, Heinz, GSK, Goldwin Healthcare, Power Horse, NourishCo., Taisho Pharmaceutical Co Ltd., Monster Energy, and Red Bull.